Curious to see if anyone else has given some more thought towards this topic and is considering going 100% into VTWAX? I switched over at the beginning of the year for stock allocation. In my 403b I do not have it available so I am sticking with Vanguard 500. Do you have it in a taxable account? I wanted to know if it qualified for the foreign tax credit and how does it compare to VTSAX in terms of tax efficiency? If I wanted to tax loss harvest, what funds could I purchase to replicate VTWAX at Vanguard? I dont have a taxable account so not sure. I would think VTSAX (TSM) and VTIAX (TISM) could be used to tax loss harvest. I've "thought about it", hard not to with constant hum on here of those advocating for it... but I'm sticking with good ol' S&P500 index fund. Best wishes to those who believe that international exposure will bring them some "diversification benefit" and even to those that believe it will outperform. You can use VTSAX and VTIAX in taxable account for TLH purposes. Just set them to world market cap allocation and let them float. The two funds will float just like VTWAX will. When you add money to the taxable account, just allocate the money to the current world market cap. Use VTWAX in your IRA's. With this method you can TLH in taxable and stick with world market cap allocation across your Vanguard accounts. If you have a 401k, you'll have to work with what you have in the 401k. After much deliberation, I took the global cap plunge and have made the switch for my and my wife's ROTH IRA's. With my 401k, I need to estimate the market cap with multiple funds and re-balance to current weights about once a year. In taxable, I am migrating from VTI to VT over the next year so I can harvest long-term capital gains over two tax years. The ER's for VTWAX/VT are not worth debating anymore in my opinion - they are plenty low enough. Even looking at what they were 5 years ago, i'm amazing out how fast they have come down and expect them to continue to do so in the future. I am thrilled to be free of the "correct / optimal" US/International allocation debate. It's exhausting, and every argument ends up being period-dependent. I was on the 100% US kool-aid for a while, but understand a lot can happen in my 30-50 year horizon. I really started to see the flaw in the "Buy the haystack, but only if it's a US haystack" argument. Toyota, Nestle, and Samsung are just as worthy as US companies. Betting 100% on a single country is not a whole lot different than betting on Technology or Healthcare because their history and fundamentals may promise out-performance. Total World Stock is the the ultimate implementation of passive equity indexing by eliminating all biases and emotional factors. "VTWAX and go do something else"
For me, owning this fund is not about attempting to outperform the S&P 500, its about admitting I know absolutely nothing about the future. If I believed I did, I might try stock picking, or load up on Technology / Healthcare / Small Value. I don't know who the best performing companies or countries are going to be for the next 30-50 years, but I know I will own them. Just as a datapoint, I wanted to point out this tweet below. 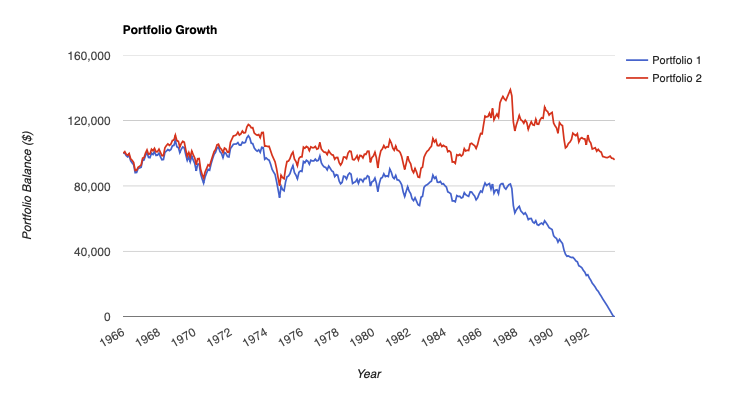 "Over the last 70 years, the US has outperformed ex-US by 1% annualized. How much of that outperformance has come since 2009? All of it." Two investors retired in December, 1965 with $100,000. Each invested in a 60/40 portfolio and withdrew $350 from the portfolio monthly starting in January, 1966 adjusting the amount for inflation. Joe invested in portfolio 1, which was 60% S&P 500 and 40% intermediate US treasury bonds. Joe figured that the US had always been exceptional and there was no reason to suspect that of changing any time soon. Bob invested in portfolio 2, which was 48% S&P 500, 12% international mutual funds (the category average of funds in Morningstar), and and 40% intermediate US treasury bonds. Bob figured that putting 20% of his equities in non-US companies might be a a good way to diversify. Joe was bankrupt in 1993 and died broke. He did, however, enjoy the smug satisfaction of using air quotes to describe Bob's portfolio as "diversified". PortfolioVisualizer allows you to import your own data series, with daily values back to 1970 (I think) and month values to 1930, so that's what I did. In this case I extracted the data from Morningstar by calling up a return chart that included their "World Large Stock" category and finding the data series in the scripts called by the page, then cleaned it and imported it into PV. The details are probably off-topic for this post, and they seem to change from time to time. The URLs for these data series used to be stable, but those stable URLs no longer seem to work for me. Bob was a smart guy, but what if Bob had invested 30% S&P 500, 30% international, and 40% intermediate treasuries? Because that’s what’s being advocated by the VTWAX champions in this thread. I was trying to avoid revealing the complete foolishness of Joe's xenophobic portfolio in my example, but since you asked . . . . I bought the U.S. only kool-aid early on also. Now world market cap is completely logical to me. it really is the ultimate boglehead allocation. I am seeing through the U.S. only arguments which don't hold much weight. It's mainly old school ideology hidden behind those arguments. I did the same with our 401k. I just estimate and re balance once a year. If you have a ton of money in the 401k, it will just float with world market cap. Last edited by lostdog on Mon Apr 08, 2019 2:54 pm, edited 1 time in total. Just noting that if we are truly talking about the Total World (or VTWAX) approach, there is no re-balancing of the equities, which defaults to annual on PV. You would need to know the relative US / Int'l market caps on the initial date and allow the portfolio to float accordingly. This may be difficult to backtest, especially if re-balancing with a bond component, and especially if introducing any periodic contributions. This particular graph may be closer to a periodically rebalanced 30 US/30 Int'l/40 Bond portfolio than a 60 Total World/ 40 Bond, which show quite different results. Haha. Thanks injecting some humor in these repetitive threads! This particular graph may be closer to a periodically rebalanced 30 US/30 Int'l/40 Bond portfolio than a 60 Total World/ 40 Bond, which show quite different results. This graph does, indeed, show a monthly rebalanced portfolio but leaving the US/ex-US allocations unrebalanced wouldn't make any appreciable difference in the result in this particular case: Joe still dies penniless and Bob ends up with $232,000 instead of $272,000. Are they? I don't know what the historical average is. Valuations may be higher than their historical averages, but on an absolute basis, developed ex US stocks don't look that expensive. The MSCI World ex US Index has a trailing PE of 14.9, a 12 month forward PE of 13.3 and a PB of 1.61. That may still be too high if long term future earnings prospects are bad, but if markets are reasonably efficient, then a 14.9 PE doesn't bode too bad for the future. Europe had a 30 PE in 2000, which partly explains why price returns have been flat since then. Is it fair to say that if you are 100% US that you do not expect the US to fall much below 55% global cap in your lifetime, but rather are expecting it to gain considerably more? I'm not sure we are immune to another 1989 over the next 30-50 years. I'm also somewhat confused by this data. It seems Total International should have outperformed from 1970 to 2018 based on the way the data is presented. Am I missing something? You can confirm with portfolio visualizer - international was flat from 87 to 94, and from 94 to 2004, whereas from 86 to 2000 the US is a nice, steady upward slope with a few gut wrenching drops along the way. Why we are extrapolating the future based off of 40 year old data I do not understand. There is no reason to assume any of this will happen again. 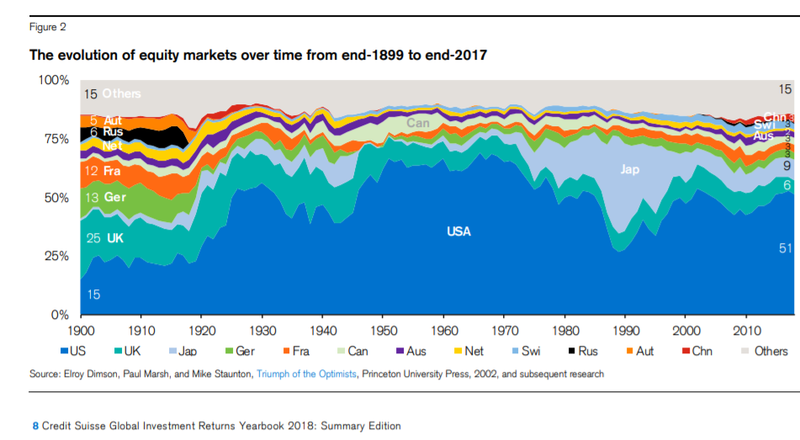 The essential reason for diversification is the future is unknown. IMO the #1 reason NOT to diversify internationally was the cost. 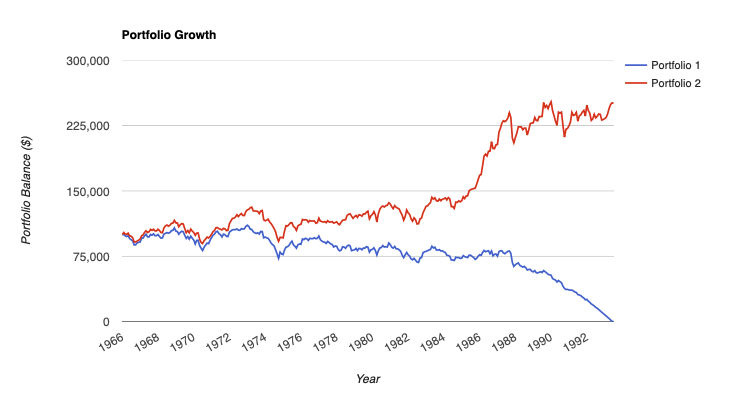 Imagine how much a world index fund would cost from 1960-1980. Why we are extrapolating the future based off of 40 year old data I do not understand. There is no reason to assume any of this will happen again. These are my top 2 reasons for choosing VTWAX. There is no reason to think anyone knows what will happen. Ownership is no longer cost prohibitive. From the 1900s to today, a lot of companies based in California become nationwide, so the folks in NYC are being exposed to the national market. And vice versa. By that logic, I could just continue to invest in NYC only equities and do just fine. If that sounds absurd, how is it any different to the statement quoted? I'll help the pro-international people out. 1. diversification means own more stocks and 10000 is more than 4000. Doesn't matter if correlation goes to 1.0, you are still more diversified in a very meaningful way. Doesn't matter if you only own two asset classes (stocks and bonds). Doesn't matter if 100 megacaps are 40% of your total equity position -- you are better diversified with 10000 stocks. 4. Remember by owning the global market cap you already own things like gold, real estate, small cap, value, low-beta, alternative asset classes in the exactly correct proportion (as determined by the marginal global know-nothing doofus investor). Vanguard will get to the point where international will no longer be a separate asset class. Correlation isn’t necessarily what’s important, but the magnitude and dispersion of returns. The past ten years, both US and International have been correlated, yet US has outperformed dramatically.